This is a unique and superbly presented collection of photographs of Newcastle United Football Club from the very early days until 1992, freshly selected from tens of thousands of images in the "Daily Mirror's" extensive archive. These evocative pictures, many of them previously unpublished, chart the rise of one of the most talked about football clubs in the English game. 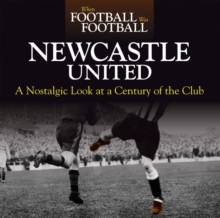 The early days and the Edwardian Masters of the 1900s, the Title and Cup winning sides of the '20s and '30s with some fabulous characters like Wee Hughie Gallacher, the Toon's immediate post-war success with a star-studded line-up, the likes of Milburn and Mitchell, and a treble of Wembley victories, to European football - and more silverware - in the '60s, to further Wembley action and larger than life characters like Supermac, then the emergence of Geordie lads Waddle, Beardsley and Gazza and the coming of the Messiah - Kevin Keegan - who captivated Tyneside as the club was transformed as the '90s opened and started on what was to be a headlining roller-coaster ride. It's all here. This book will bring to life the nostalgia of such a colourful history.